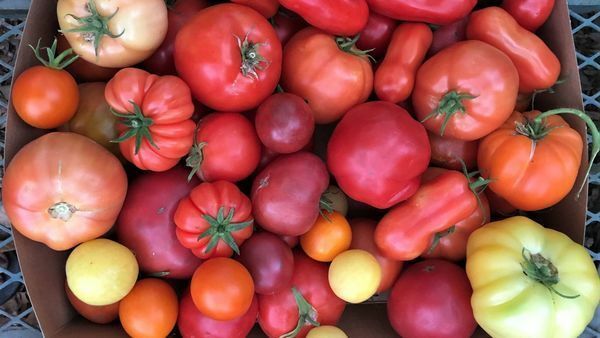 Looking out the window at my garden, I find it hard to imagine it without containers. 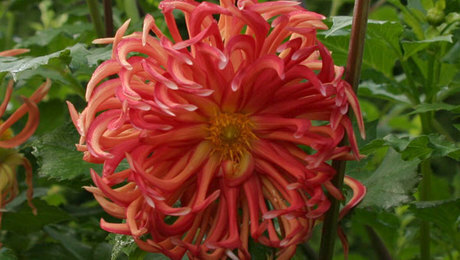 Sixty of them, strategically placed throughout my garden, provide design solutions for difficult places. 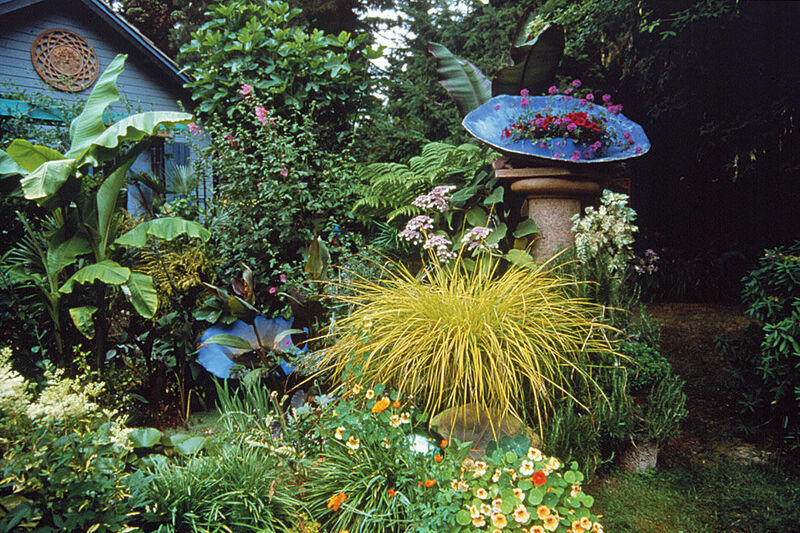 I use containers as major structural elements to help create the framework of the garden, or as visual cues to lead the eye along a path or toward a destination. I also place them to screen unsightly views. 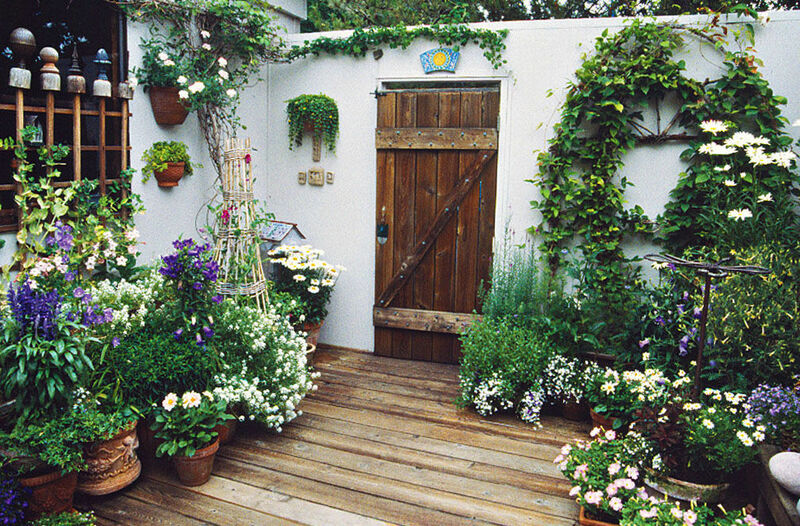 Patios, decks, and entryways become lush, intimate spaces when I embellish them with containers. 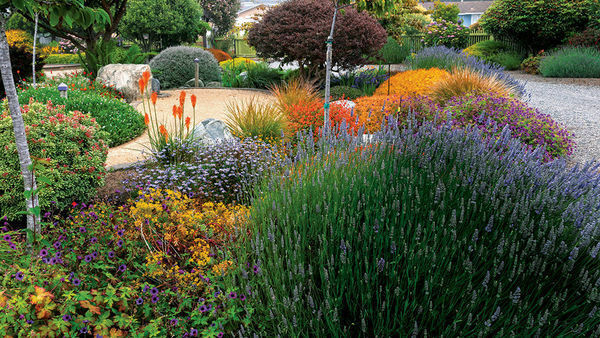 And I often add containers to a bed or border to introduce a new color or shape. 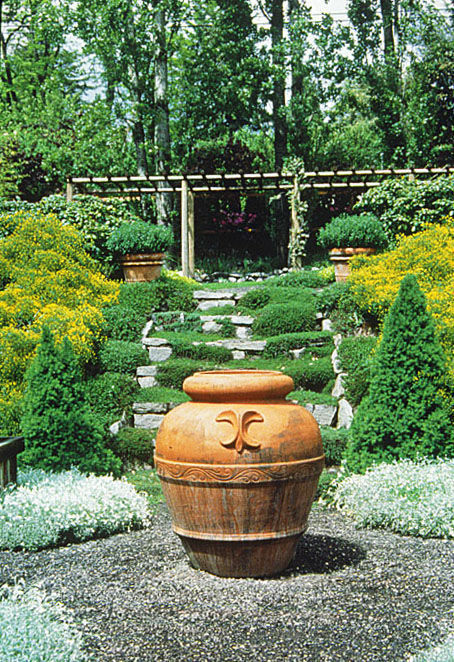 Artfully designed and beautifully planted containers are striking on their own, but using them throughout a design also adds a sense of coherence to a garden. 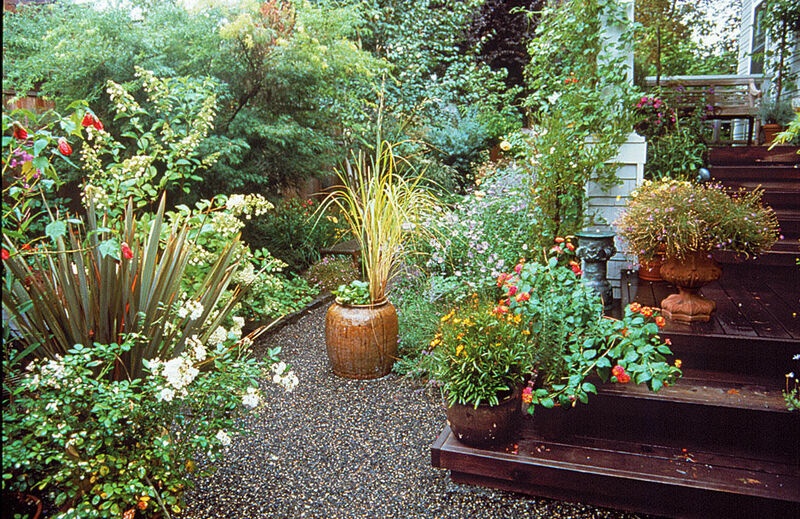 Here are some examples, from gardens I have designed and others I have visited, of the way careful and considered placement of containers can be used to resolve design challenges. 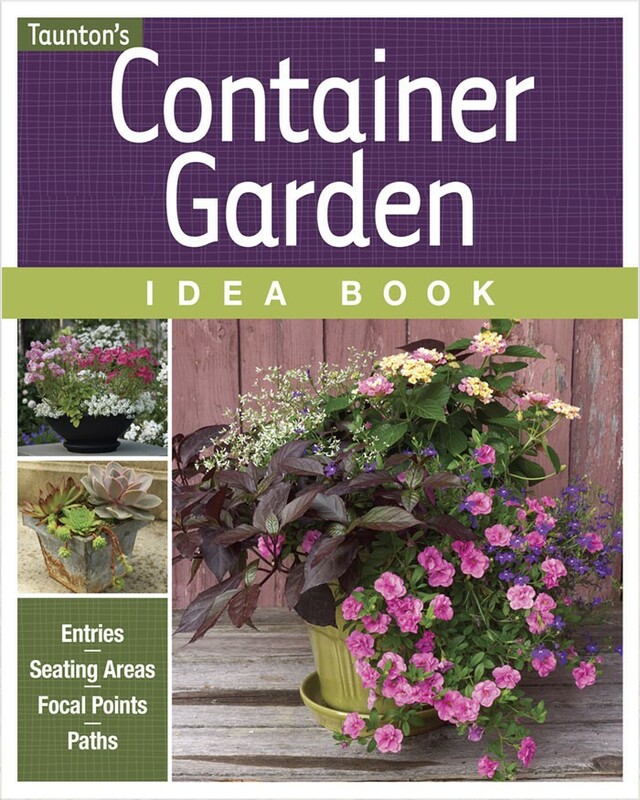 Plants in containers visually link the arbor to its horizontal surroundings. 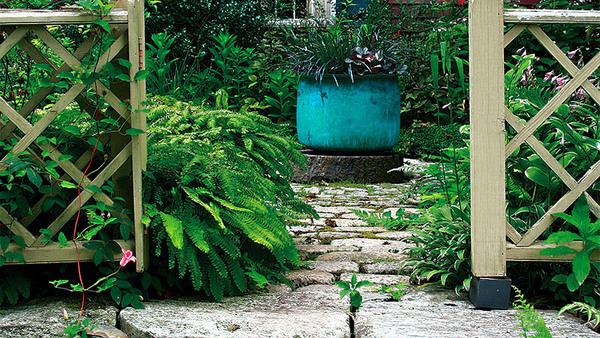 A pot at the convergence of paths becomes a focal point. By arranging a group of three containers together on a brick pad at the base of a large arbor in my back garden, I was able to link the vertical structure to the horizontal ground plane and create the illusion that the arbor is surrounded by a garden rather than by a lawn (below left). 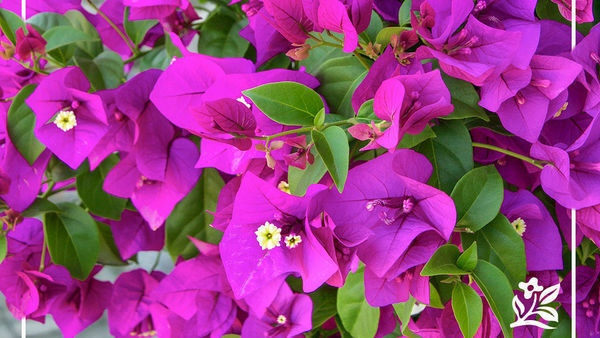 The massing of plants at the base of the arbor also balances the overhead tangle of rose canes and clematis vines. 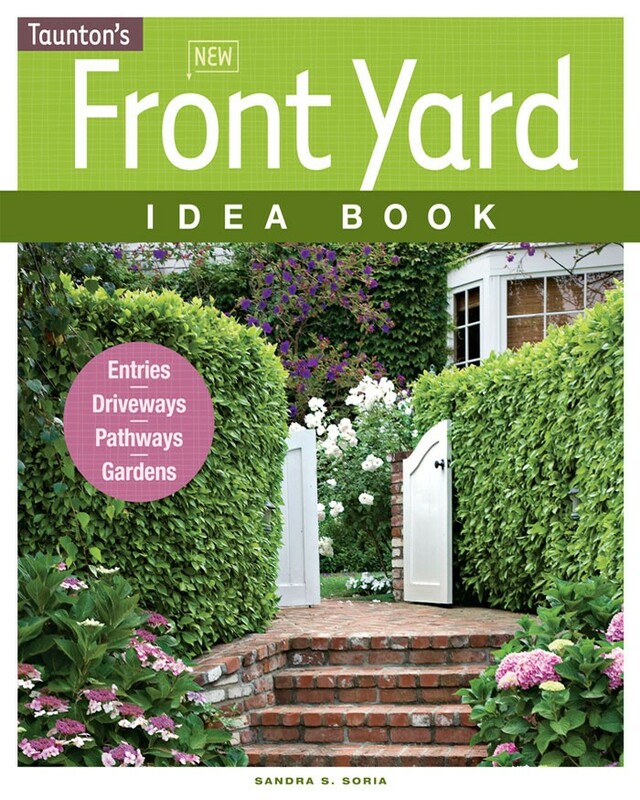 Placing a pot where several sight lines or pathways converge (above right) draws the eye forward and pulls you into the garden. 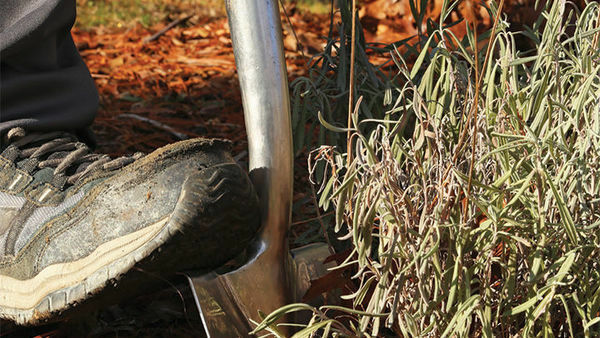 The pot becomes a focal point, acting as a major structural element of the design. Pots at the corner of the terrace signal the transition from porch to walkway. 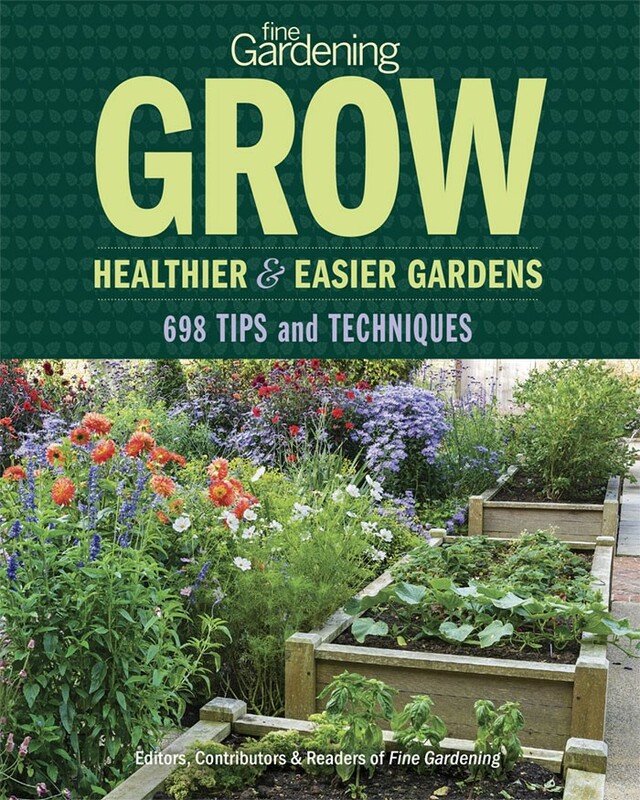 Throughout the garden, I strategically place containers to help direct traffic and alert visitors to changes as they move from one space to the next. I use groups of pots on either side of a step to signal an elevation change. 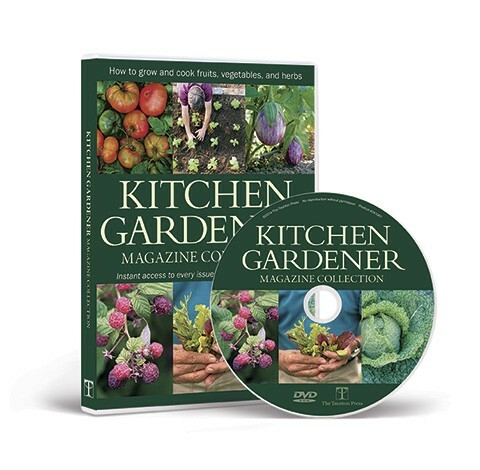 Pots sitting in a path (above) or on the edge of a walkway or deck force you to slow down and consider the garden as you walk by. I also use pots to signal the transition between paved and unpaved surfaces. I set a group of terra-cotta pots on the corner of my terrace to prevent visitors from stepping off into the garden and forging a new trail in the lawn. By lining my stairs with large pots, I subtly lure visitors from the front walk to the porch. 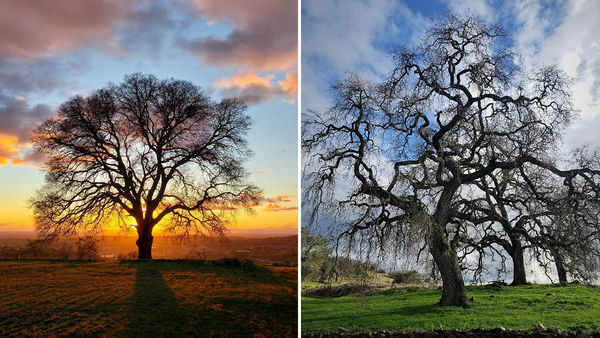 Every three months, I install new plant combinations that reflect the changing cycle of the seasons so visitors always have something new to look at. 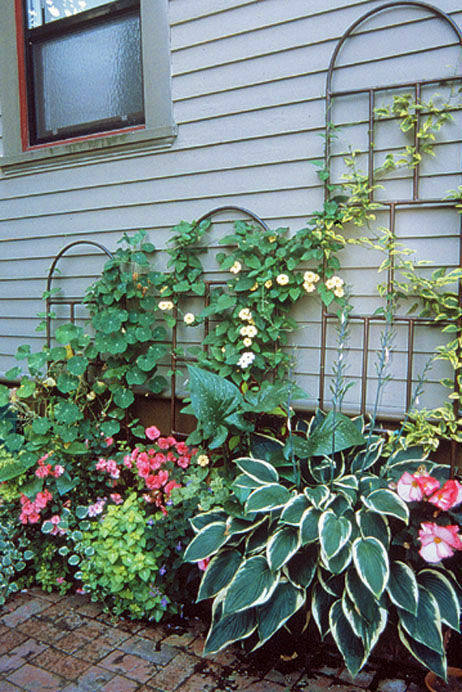 Trellised container vines make a blank space more interesting. 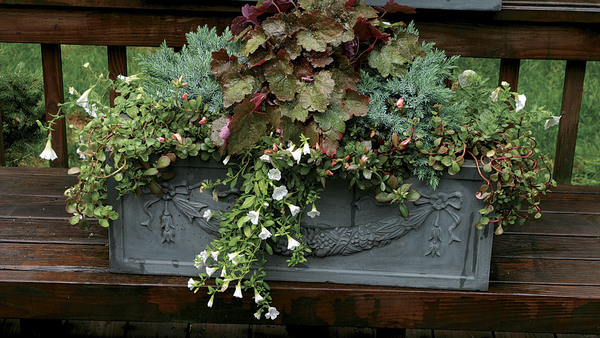 Copper trellises in pots form the framework for a display of flowers and foliage. In my garden, the terrace butts right up to the north side of the house, presenting an unattractive, looming, blank façade to the garden. To make the blank wall more interesting, I mounted two wirework hayracks with attached trellises onto the wall at window height and planted annual vines to scramble up the wall and trailing fuchsias and impatiens to spill over the sides (below left). In this way I was able to transform an uninteresting space using color and fragrance. On the other terrace, three rectangular terra-cotta pots sit against the wall of the house (below right). 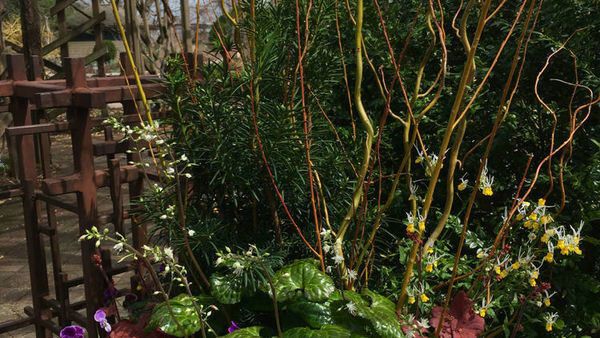 A handcrafted copper trellis in each pot supports various vines as they scramble upward, clothing the wall with flowers and foliage. 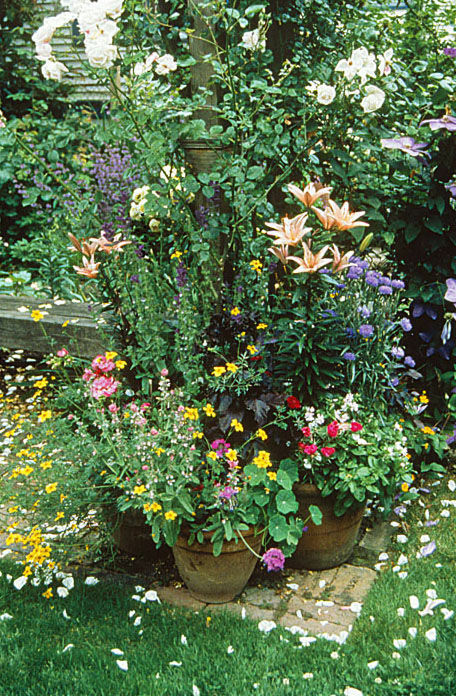 Annuals in a pot liven up a garden border. 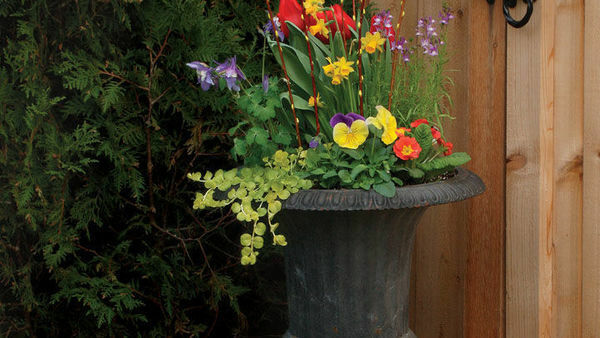 I often use pots to add height or color to a garden bed where these elements are missing. 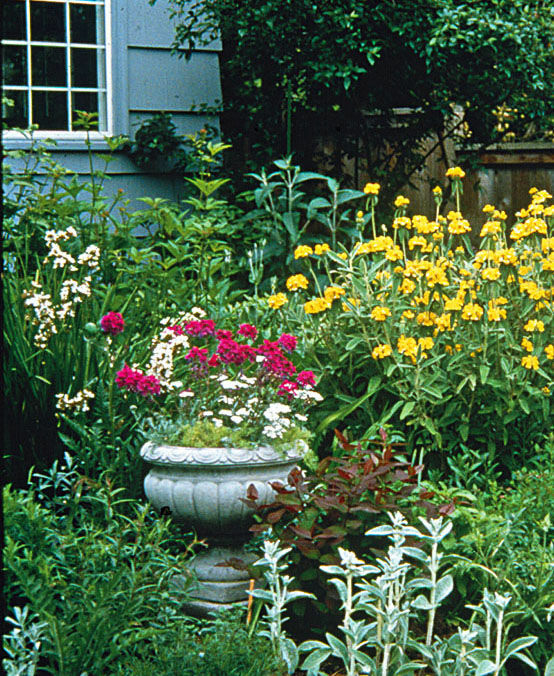 In one garden (right), I placed a pot of annuals in a border when a shot of color was needed. I like the versatility of switching pots in and out of beds and the ability to change the feel of the garden by manipulating small vignettes on a moment’s notice. At a friend’s garden, a cobalt-blue pot placed in a dark spot in a bed draws your eye in and makes the space seem larger while it unites the garden and architecture by echoing the color of the nearby house (below). 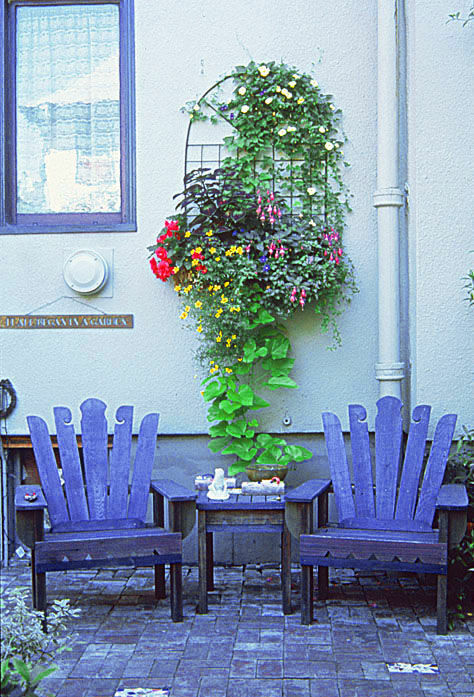 A blue pot draws the eye in and makes the space seem larger, while echoing the color of the nearby house. 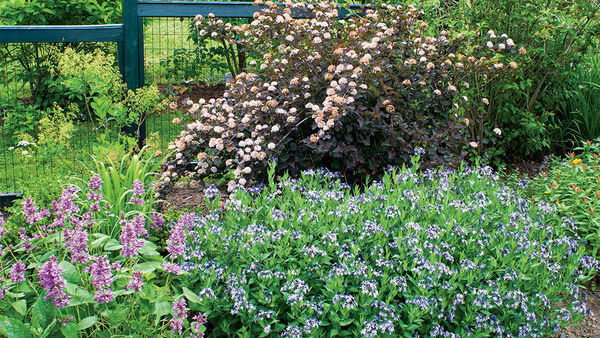 Pots of annuals and perennials on a deck provide visual interest, color, and fragrance throughout the summer. Containers situated in outdoor living areas (right) become part of the furnishings, adding visual interest, color, and fragrance. 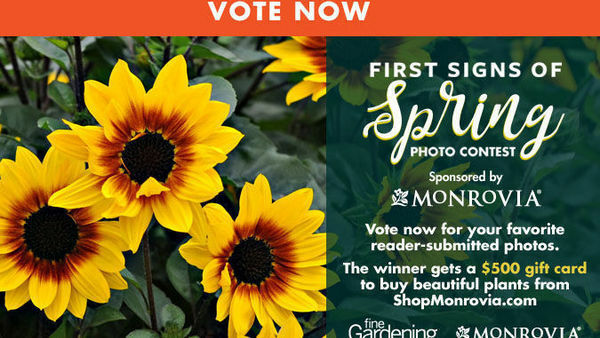 Here, an empty deck comes alive when filled with pots of annuals and perennials planted to provide a succession of color throughout the summer. 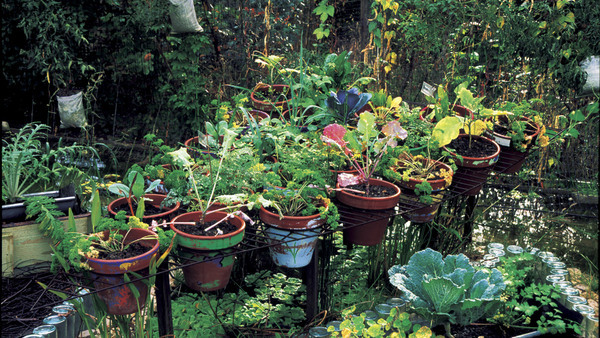 Even the smallest balcony or terrace can be transformed into a lush Eden by groups of pots.